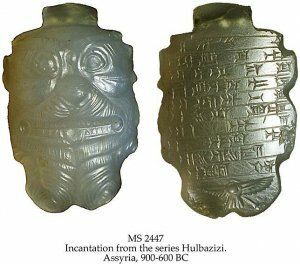 Text	 INCANTATION FROM THE SERIES HULBAZIZI, LINES 63-67: MAY SÎN, LORD OF THE CROWN, QUIETEN YOU; MAY NINURTA, LORD OF WEAPONS, BREAK YOUR WEAPONS; MAY NERGAL, LORD OF THE NETHERWORLD HOLD YOU IN BATTLE; MAY EA AND ASALLUHI CUT OFF YOUR POISON. CLEAR OFF! 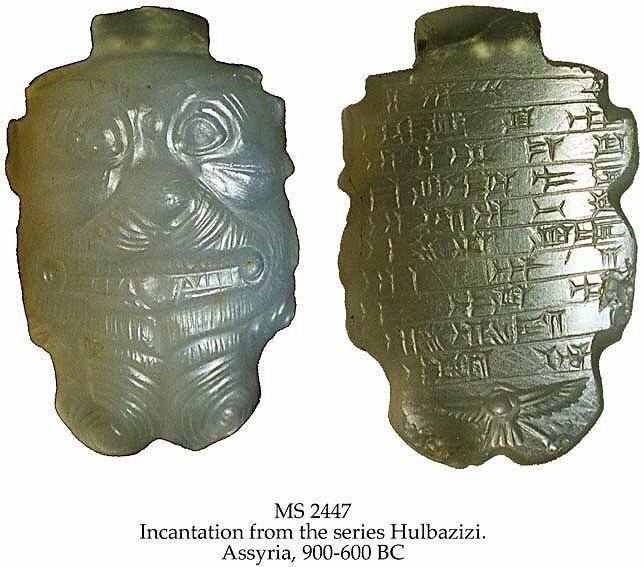 Description	 MS in Assyrian on white chalcedony, Assyria, 900-600 BC, 1 demon head, 3,4x2,2x1,3 cm, 10 lines in cuneiform script, with a fine detailed visage of the demon Pazuzu combining human and lionine features, deeply carved on one side, and a winged solar disc beneath the text. Binding	 Barking, Essex, 1998, blue quarter morocco gilt folding case by Aquarius. Context	 Another incantation from the Hulbazizi series is MS 3001.